Plant-made antibodies used as therapy for Ebola in humans: post-exposure prophylaxis goes green! 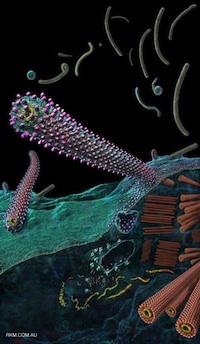 Ebola virus budding from an infected cell. Yes, I know you fans of ViroBlogy like Ebola – and just coincidentally, I was desperately trying to finish a review*# on “Plant-based vaccines against viruses” against a backdrop of an out-of-control Ebola epidemic in West Africa, when three different people emailed me different links to news of use of a plant-made monoclonal antibody cocktail. I immediately included it in my review – and I am publishing an excerpt here, for informations’ sake. Enjoy! The production of anti-Ebola virus antibodies has recently been explored in plants: this could yet become an important part of the arsenal to prevent disease in healthcare workers, given that at the time of writing an uncontrolled Ebola haemorrhagic fever outbreak was still raging in West Africa, and the use of experimental solutions was being suggested (Senthilingam, 2014). For example, use of a high-yielding geminivirus-based transient expression system in N benthamiana that is particularly suited to simultaneous expression of several proteins allowed expression of a MAb (6DB) known to protect animals from Ebola virus infection, at levels of 0.5 g/kg biomass (Chen et al., 2011). The same group also used the same vector system (described in detail here (Rybicki and Martin, 2014)) in lettuce to produce potentially therapeutic MAbs against both Ebola and West Nile viruses (Lai et al., 2012). A more comprehensive investigation was reported recently, of both plant production of Mabs and post-exposure prophylaxis of Ebola virus infection in rhesus macaques (Olinger et al., 2012). Three Ebola-specific mouse-human chimaeric MAbs (h-13F6, c13C6, and c6D8; the latter two both neutralising) were produced in whole N benthamiana plants via agroinfilration of magnICON TMV-derived viral vectors. A mixture of the three MAbs – called MB-003 – given as a single dose of 16.7 mg/kg per Mab 1 hour post-infection followed by doses on days 4 and 8, protected 3 of 3 macaques from lethal challenge with 1 000 pfu of Ebola virus. The researchers subsequently showed significant protection with MB-003 treatment given 24 or 48 hours post-infection, with four of six monkeys testing surviving, compared to none in two controls. All surviving animals treated with MB-003 experienced insignificant if any viraemia, and negligible clinical symptoms compared to the control animals. A significant finding was that the plant-produced MAbs were three times as potent as the CHO cell-produced equivalents – a clear case of plant production leading to “biobetters”. A follow-up of this work investigated efficacy of treatment with MB-003 after confirmation of infection in rhesus macaques, “according to a diagnostic protocol for U.S. Food and Drug Administration Emergency Use Authorization” (Pettitt et al., 2013). In this experiment 43% of treated animals survived, whereas all controls tested here and previously with the same challenge protocol died from the infection. In news from just prior to submission of this article, a report quoted as coming from the National Institute of Allergy and Infectious Diseases states that two US healthcare workers who contracted Ebola in Liberia were treated with a cocktail of anti-Ebola Mabs called ZMapp – described as a successor to MB-003 – developed by Mapp Pharmaceutical of San Diego, and manufactured by Kentucky BioProcessing (Langreth et al., 2014). Despite being given up to nine days post-infection in one case, it appears to have been effective (Wilson and Dellorto, 2014). A novel application of the same technology was also used to produce an Ebola immune complex (EIC) in N benthamiana, consisting of the Ebola envelope glycoprotein GP1 fused to the C-terminus of the heavy chain of the humanised 6D8 MAb, which binds a linear epitope on GP1. Geminivirus vector-mediated co-expression of the GP1-HC fusion and the 6D8 light chain produced assembled immunoglobulin, which was purified by protein G affinity chromatography. The resultant molecules bound the complement factor C1q, indicating immune complex formation. Subcutaneous immunisation of mice with purified EIC elicited high level anti-GP1 antibody production, comparable to use of GP1 VLPs (Phoolcharoen et al., 2011). This is the first published account of an Ebola virus candidate vaccine to be produced in plants. Chen, Q., He, J., Phoolcharoen, W., Mason, H.S., 2011. Geminiviral vectors based on bean yellow dwarf virus for production of vaccine antigens and monoclonal antibodies in plants. Human vaccines 7, 331-338. Lai, H., He, J., Engle, M., Diamond, M.S., Chen, Q., 2012. Robust production of virus-like particles and monoclonal antibodies with geminiviral replicon vectors in lettuce. Plant biotechnology journal 10, 95-104. Langreth, R., Chen, C., Nash, J., Lauerman, J., 2014. Ebola Drug Made From Tobacco Plant Saves U.S. Aid Workers. Bloomberg.com. Olinger, G.G., Jr., Pettitt, J., Kim, D., Working, C., Bohorov, O., Bratcher, B., Hiatt, E., Hume, S.D., Johnson, A.K., Morton, J., Pauly, M., Whaley, K.J., Lear, C.M., Biggins, J.E., Scully, C., Hensley, L., Zeitlin, L., 2012. Delayed treatment of Ebola virus infection with plant-derived monoclonal antibodies provides protection in rhesus macaques. Proceedings of the National Academy of Sciences of the United States of America 109, 18030-18035. Pettitt, J., Zeitlin, L., Kim do, H., Working, C., Johnson, J.C., Bohorov, O., Bratcher, B., Hiatt, E., Hume, S.D., Johnson, A.K., Morton, J., Pauly, M.H., Whaley, K.J., Ingram, M.F., Zovanyi, A., Heinrich, M., Piper, A., Zelko, J., Olinger, G.G., 2013. Therapeutic intervention of Ebola virus infection in rhesus macaques with the MB-003 monoclonal antibody cocktail. Science translational medicine 5, 199ra113. Phoolcharoen, W., Bhoo, S.H., Lai, H., Ma, J., Arntzen, C.J., Chen, Q., Mason, H.S., 2011. Expression of an immunogenic Ebola immune complex in Nicotiana benthamiana. Plant biotechnology journal 9, 807-816. Rybicki, E.P., Martin, D.P., 2014. Virus-Derived ssDNA Vectors for the Expression of Foreign Proteins in Plants. Current topics in microbiology and immunology 375, 19-45. Senthilingam, M., 2014. Ebola outbreak: Is it time to test experimental vaccines? CNN. Wilson, J., Dellorto, D., 2014. 9 questions about this new Ebola drug. CNN.